Jeremy Samuel Piven (born July 26, 1965) is an American actor and producer. 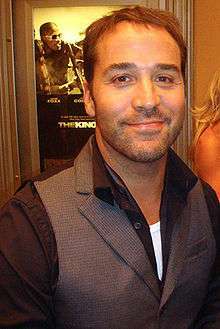 He is best known for his roles as Ari Gold in the comedy series Entourage, for which he won a Golden Globe Award and three consecutive Emmy Awards, and as Spence Kovak on Ellen DeGeneres's sitcom Ellen. He also starred in the British period drama Mr Selfridge, which tells the story of the man who created the luxury English department store chain Selfridges. Piven is a native of New York City, born in Manhattan, the son of Byrne Piven (1929-2002) and Joyce Hiller Piven (née Goldstein), both of whom were actors and drama teachers. He grew up in Evanston, Illinois. Piven was raised in a Reconstructionist Jewish household. He graduated from Evanston Township High School, and attended Harand Theater Camp in Elkhart Lake, Wisconsin as a teenager. He played Bernardo in West Side Story there. In Illinois, he trained at Piven Theatre Workshop, founded by his parents. He also attended Drake University in Des Moines, Iowa, where he departed after his sophomore year to attend New York University's Tisch School of the Arts. He left Tisch during his senior year to pursue his acting career and is an alumnus of the Pi Kappa Alpha fraternity. He spent a semester at the National Theater Institute (NTI) at the The Eugene O'Neill Theater Center in Waterford, Connecticut. He has appeared in a number of films with John Cusack, who is also from Evanston and is a fellow alumnus of the Piven Theatre Workshop (as are Cusack's sisters Joan and Ann). Piven and Cusack once shared an apartment and have been friends since high school. Beginning in 2004, Piven achieved significant success playing fast-talking, acerbic Hollywood agent Ari Gold in the HBO series Entourage. He received Emmy nominations for Best Supporting Actor four straight years from 2005 to 2008, and won the award in 2006, 2007, and 2008. 2009 was the first year in which he did not receive an Emmy Award nomination for his work on the show. He also received Golden Globe nominations from 2005 to 2010 for the role, winning in 2008. In 2007, Piven appeared in the video for "Drivin' Me Wild", the third single taken from rapper Common's seventh album Finding Forever. The two were co-stars in Smokin' Aces, and appeared together when Piven hosted SNL in January 2007. Piven appeared in the first Broadway revival of David Mamet's Speed-the-Plow, co-starring Mad Men star Elisabeth Moss and three-time Tony nominee Raul Esparza. The production began preview performances on October 3, 2008, and opened on October 23, 2008; the play was due to run through February 22, 2009. After Piven missed several performances, on December 17, 2008, Piven's rep. announced that due to an undisclosed illness, Piven would be ending his run in the play effective immediately. The illness was revealed to be hydrargaria, a disease caused by exposure to mercury or its compounds, though the source is unknown. Rumours have indicated that the high level of mercury could potentially have been caused by Piven's habit of consuming fish twice a day for the past 20 years. An alternative explanation is that the herbal remedies Piven was taking were responsible for his high levels of mercury. Mamet joked that Piven was leaving the play "to pursue a career as a thermometer." On September 1, 2009, Piven, in a guest appearance on the Late Show with David Letterman, explained that he had given up red meat and poultry, and had been getting all of his protein from fish for the past 20 years. William H. Macy and Norbert Leo Butz replaced Piven in the Broadway show. On August 3, 2009, Piven was the guest host of the WWE Raw wrestling program. During an in-ring appearance, he incorrectly referred to the wrestling promotion's SummerSlam event as "Summerfest". In August 2011, Piven stated he was interested in portraying the drummer from the Who, Keith Moon. From 2013 to 2016, he played the title role in the British television drama series Mr Selfridge, the semi-fictional story based on the life of Harry Selfridge, the founder of the London department store Selfridge's. The show aired on the ITV network in the United Kingdom and PBS in the United States. Piven was born to Jewish parents (of Russian origin) and considers himself Jewish. He starred in the Travel Channel special Jeremy Piven's Journey of a Lifetime detailing his journey across India. Piven resides in Malibu, California. His sister is director Shira Piven, whom he has described as one of his first acting teachers; his brother-in-law is director Adam McKay. Piven is a fan of the Chicago Bears, and in 1998 appeared in commercials for the Chicago Blackhawks. 1997 Drew Carey Show, TheThe Drew Carey Show Spence Kovak Episode: "Drew Gets Married"
1 2 3 "Jeremy Piven Biography". filmreference. 2008. Retrieved 2008-10-29. ↑ "Jeremy Piven as Ari – Entourage". HBO. Retrieved 2012-03-16. ↑ "Piven, Byrne". Chicago Tribune. 2002-02-21. ↑ Dandelife.com : Story : "poo is in *newsweek*", by caroline m Archived October 11, 2007, at the Wayback Machine. ↑ "Piven Theatre Workshop – Home". Piventheatre.org. Retrieved 2012-03-16. ↑ "Jeremy Piven, Employing His Acting Skills". washingtonpost.com. 2004-07-14. Retrieved 2012-03-16. ↑ "List of famous PIKES". Iastatepikes.com. Retrieved 2012-03-16. ↑ "Jeremy Piven Emmy Nominated". Emmys.com. Retrieved 2012-03-16. ↑ SNL Archives | Episode. Retrieved October 10, 2007. ↑ "Discussion of the possible cause of poisoning". Jdc325.wordpress.com. Retrieved 2012-03-16. ↑ Silverman, Stephen M. (2008-12-18). "Jeremy Piven Abruptly Abandons Broadway Play". people.com. ↑ "Jeremy Piven wants to play Keith Moon?". Keithmoonmovie.com. 2011-08-15. Retrieved 2012-03-16. ↑ "Jeremy Piven Gets A Body Double". YouTube. 2009-04-22. Retrieved 2012-03-16. ↑ "Jeremy Piven Discusses American Muscle Cars, Hot Wheels, and Being a Jewish Buddhist". Complex. 2011-02-18. Retrieved 2012-03-16. ↑ "The Star Online eCentral: Jeremy's journey". Star-ecentral.com. 2006-10-17. Retrieved 2012-03-16. ↑ "Interview: Shira and Jeremy Piven Discuss Their Indie Comedy, "Fully Loaded"". ulu.com. 2013-04-01. Retrieved 2014-09-13. ↑ "Jeremy Piven juggles movie premiere, watching Bears". ESPN. Retrieved February 15, 2011.